There’s a lot of mixed advice out there when it comes to fitness in general and especially stretching! We’ve tapped our experts to bring you the most accurate and helpful information to guide your flexibility training. Be open to discovering what will work best for your body, and use the tips below to help you navigate common myths about stretching! Attention: CHANGE IS POSSIBLE! With StretchIt, you can experience benefits starting at any level of flexibility. Studies have shown that flexibility training can improve your blood circulation, release muscle tightness, and help your muscles work more effectively—not to mention all the mental benefits of a good stretch! As you get older, stretching will become even more important as a way to stay supple, maintain your balance, and slow the effects of aging. If you don’t think of yourself as flexible, double-down on a consistent commitment to stretching. Sort through the myths and go after your goals! Some old school advice might tell you to go straight to stretching before a workout. Newsflash: not cool! While mobility exercises that bring blood flow to your muscles and joints can be a helpful way to warm up, don’t go straight to deep stretches. This can weaken your muscles and promote injury. Make sure to complete the warm-up portion of each StretchIt class before you attempt deeper flexibility poses. Once the body is prepared and thoroughly warmed up, then it’s safe to go further with your training. 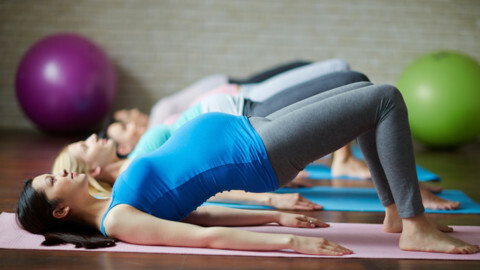 Even if you’re already bendy, flexibility workouts can be really good for you. Some people are naturally hypermobile and can benefit from focusing on strengthening and stabilizing exercises. Each StretchIt class is a healthy, safe workout that emphasizes an active approach with proper technique and muscle engagement. For the hypermobile, this engagement can be quite a challenge even if touching your foot to head is a breeze. Also, you can lose flexibility and mobility over time, so it’s important to create healthy lifestyle habits that involve regular physical activity. Studies show that increasing your flexibility may be a result of an increased ‘stretch tolerance’ rather than an elongation of your muscle fibers. Stretch tolerance refers to your nervous system and your ability to experience the physical sensations of stretching. With greater stretch tolerance, you reduce the discomfort felt at the end range of motion, unlocking greater flexibility. Over long periods of time and with consistent practice, you can make structural changes to your body but most of the changes you’ll see in the short term will be gains related to stretch tolerance. That’s why it’s so important to use your breath as well as a positive mindset to approach your training. Flexible mind = flexible body! Think of making improvements to your flexibility as a long-term journey. Stretching will feel uncomfortable at times, but there is no need for pain on this journey. Approach your training sessions with safety as your number one priority: it’s better to avoid injury than to push yourself into an extreme position in the short-term, only to experience an injury that will take you out of the game in the long-term. If you feel sensations such as ‘crunching,’ intense ‘compressing,’ or ‘smashing,’ we encourage you to back off or make a modification for the pose. How do you distinguish between pain that will hinder your progress and sensations that are a natural part of getting into a new range of motion? Aim for a discomfort level of 5-6 out of a scale of 10. Huge amounts of intensity aren’t necessary to make gains in your flexibility; it’s consistency and safe progressions that matter. Trust the process and focus on stabilizing and strengthening at the end range of your motion so your body can adapt to a new norm. If you’re ever taking a class and something doesn’t feel right, try a modification that will target the same area in a different way that’s better suited for your body. That might mean easing out of your split a bit and re-squaring your hips, or it might mean doing a high-V straddle on your back instead of attempting a froggy position. If the pain you’re experiencing is greater than the stretching sensation, it’s best to come at it from a different angle. Also, if you have an injury or a serious condition that affects your ability to train, we encourage you to work with a healthcare professional such as a physical therapist, so that you can receive personalized assistance with your modifications and limitations. We hope this advice will help you build a safe, effective, and fun training routine. If you have any questions, we'd love to hear from you! Happy stretching! Keep up the amazing work with your flexibility training!